I am installing a 21' AGP with my husband in our backyard. Everything was going well until we put the wall in. It was about a foot short. I told him that we needed to take the wall out and re-gap the track, but he had his own ideas of how to do it. Well, it worked somewhat, now we are only about 3" away. I can see that there are about 2-3 plates that have slack still in them, otherwise all of them are butted up completely. My husband decided to go ahead and bolt the wall together thinking he could push the wall into place once it was together, but it is not working. Also, assuming we get the pool together yet this year, lol... we are approaching fall very quickly and our temperatures are dropping. Our highs are only in the 70s if we are lucky during the day and much colder at night. The pool is in the shade. Will we be ok to still install the liner this fall? I'm hoping by next weekend, asking as we can get this wall together. Hi This is a good example of uniform rail gap, it needs to be uniform. Rail gap can be all the way from a half an inch to none. At one time Asahi Pools had a 15' pool with a negative gap. With all the rails butted up we still had to cut the last bottom rail a little to make the sidewall fit. The wall needs to fit top and bottom before it is bolted up and all the gaps need to be uniform. 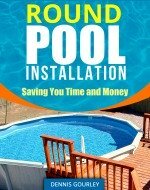 In cooler weather you need to make use of direct sunlight before you install the pool liner. Direct sun is more important than temperature.